Learn how to make frosting with easy step-by-step instructions. Sweet and creamy homemade frosting is easy to make and takes very little time. Once you learn how to make icing at home, you will not need or want to buy canned frosting ever again. Most cakes seem bare without frosting of some sort. When placed side by side, a frosted cake will win over a plain cake every time. No one frosting is exclusive to any one cake, so you can create your favorite combinations. Cupcakes, brownies and cookies are even more festive when frosted. Although cakes date back to ancient times, cake as we know it today appeared in the mid 1800’s. The first icings were made of sugar and egg whites and were boiled. The icing was then poured over the cake and the cake was then returned to the oven to bake a little longer. When removed from the oven, the icing quickly cooled and formed a hard glossy texture. In the late 1800’s, creamy frosting as we know it today, replaced the early glaze variety. Whether you call it frosting or icing largely depends on where you live. 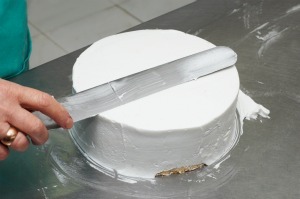 Although there are some differences in the texture of frosting and icing, most people use the terms interchangeably. From a simple frosting to a cooked frosting, from chocolate to strawberry, we have cake frosting recipes that will compliment your favorite baked goods.